Seattle sends its second-round pick from last year, outfield prospect Josh Stowers, to the Yankees as part of the trade. In the constant search for young, athletic talent that fits in the Mariners’ new plan of a “step back” in 2019 and a push forward with a club controllable roster starting in 2020-2021, general manager Jerry Dipoto added another well-regarded prospect in exchange for a well-regarded prospect who is younger with less professional baseball experience. Monday afternoon, the Mariners announced they had acquired infield prospect Shed Long from the Yankees in exchange for outfield prospect Josh Stowers. The trade was part of a three-team deal with the Mariners, Reds and Yankees. Long, who was drafted and developed by Cincinnati, started Monday as a member of the Reds’ organization. But he was sent to the Yankees along with a competitive balance round “A” selection in exchange for veteran right-hander Sonny Gray, who signed a contract extension with the Reds as part of the deal. The Yankees then flipped Long to the Mariners for Stowers. To make room on the 40-man roster for Long, the Mariners designated infielder/pitcher Kaleb Cowart for assignment. Seattle had claimed Cowart off waivers from the Angels. The hope is that he will clear waivers and the Mariners can outright him to the minor-league system so he can continue to work as a two-way player. The Mariners, who have been interested in acquiring Long from the Reds for the past few months in a variety of scenarios, finally were able to access him in a deal with the Yankees by giving up Stowers. It’s basically an exchange of prospects between the two teams. But Long is considered slightly more advanced than Stowers for the near future. 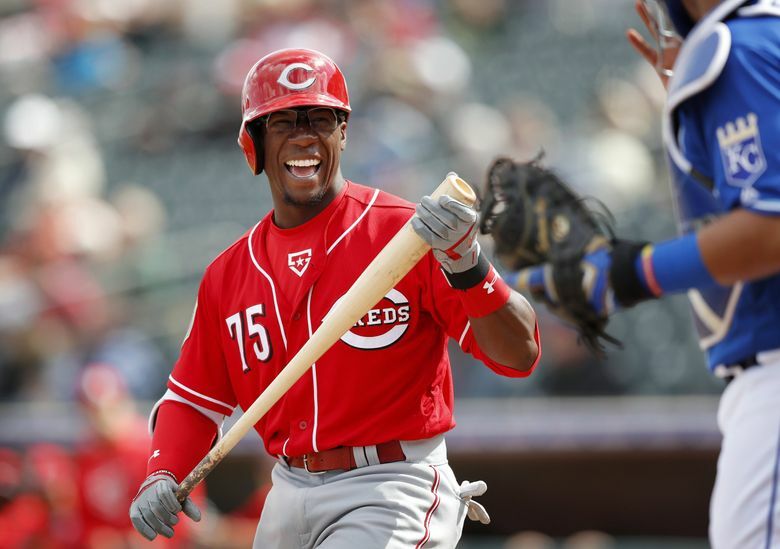 Long, 23, was rated as the Reds’ No. 7 prospect in their system by MLB Pipeline and No. 8 prospect by Baseball America. A speedy second baseman with some power, he posted a .261/.353/.412 slash line with 22 doubles, 5 triples, 12 homers, 56 RBI and 19 stolen bases with Class AA Pensacola last season. He represented Pensacola in the Southern League All-Star game, going 2 for 3 with a double and a homer. Selected as a catcher in the 12th round of the 2013 draft out of Jacksonville High School in Alabama, Long was converted to infield to take advantage of his speed and athleticism after his first two professional seasons. He blossomed as a second baseman and was even the top defensive second baseman in the Southern League in 2017. Dipoto said in a radio interview with ESPN Seattle 710 that the team plans to keep Long at second base for his primary position, but will also have him see some action at third base and left field to take advantage of his athleticism. Long is expected to start the season at Class AAA Tacoma. While he hasn’t played above the Class AA level, Long does seem like a logical replacement if/when the Mariners eventually trade second baseman Dee Gordon. Stowers, 21, was selected in the second round of the draft last year out of the University of Louisville. In his first professional season, he posted a .260/.380/.410 slash line with 15 doubles, 5 homers and 28 RBI in 58 games for short-season Everett. He was rated as the Mariners’ No. 10 prospect by both Baseball America and MLB Pipeline. But with Kyle Lewis, Jarred Kelenic, Braden Bishop, Jake Fraley, Dom Thompson-Williams and eventually Julio Rodriguez, the Mariners have a surplus of outfield prospects, making Stowers somewhat expendable.